Because the Bedside CPAP Table rests just beneath your mattress, it keeps your CPAP very close to hand. 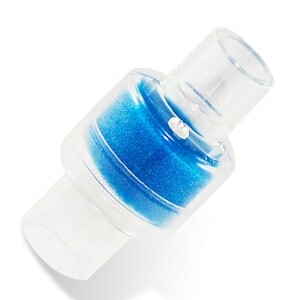 This is especially convenient for quick access to settings or to turn the machine on or off at night. In addition the lower positioning can help make lights from the CPAP less visible and noise from operation less distinct. The CPAP Bedside Table is universally compatible with a sturdy fabric platform, measuring 13.5 x 10.0 inches, that is wide enough to accommodate any CPAP machine, and most heated humidifiers as well. A strong bungie cord is included to hold your CPAP in place so that it can't be accidentally knocked off of the platform by overactive pets or errant CPAP tubes! Made from 8 sections of premium strength, lightweight aluminum the compact Bedside CPAP Table's frame is easy to assemble. The water resistant fabric platform slides onto the frame and is secured with metal buttons and a bungie cord to create a sturdy shelf. 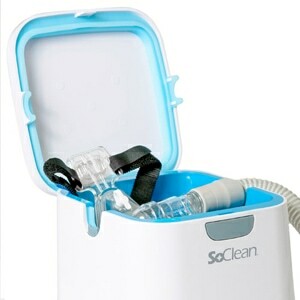 Overall assembly takes about 3 minutes and the Bedside CPAP Table can be left in place as long as it's needed. 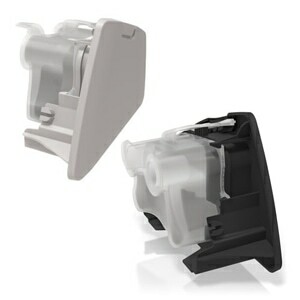 Great for home and travel the Bedside CPAP Table is as easy to disassemble as it is to put together. When disassembled the entire table measures about 11.5 x 4.0 x 1.5 inches and weighs less than a pound. And while it works best between a mattress and box spring, it can also be used with futons, sofa beds, and other similar temporary sleeping arrangements. USAGE TIPS: Always make sure that the Bedside CPAP Table is secured firmly between your box spring and your mattress so that it cannot shift or fall. Some bedding systems like water beds, Sleep Number beds, adjustable beds, and floatation systems may not be appropriate for use with the Bedside CPAP Table. Use caution when setting it up for the first time. DirectHomeMedical cannot be held responsible for any damage caused by use of the Bedside CPAP Table. I love it so much I want to buy another. I had it sent to my daughter's house where I would be staying and fell in love with it. It is the perfect size. Now I need to buy another one for home. 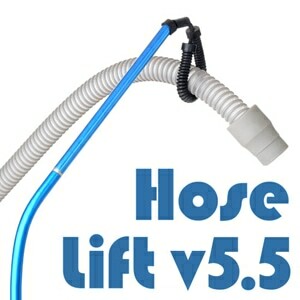 The hose lift has a series of blue aluminum tubular sections with an elastic cord threaded through them. 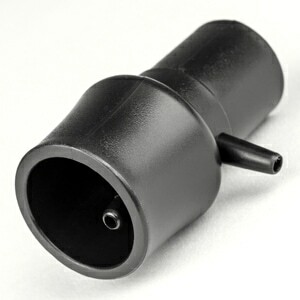 The bottom end of this cord is attached to its black plastic rectangular base. The base easily slips under the edge of the mattress deep enough to make it quite stable. The elastic cord threads tthrough all these blue sections up to a slightly bent piece at the top that terminates with a loop that is where your CPAP hose can be threaded through. That loop is built in such a way that it will never pinch or damage your CPAP hose. I really love the design. Each section of this blue aluminum tubing that's about 8 inches perhaps long is beautifully machined and the blue coating for all the years I've had it has never scratched. It puts itself together very similar to the way some outdoor tent braces are designed: you simply take it out of its little pouch travel pouch which makes it very convenient for travel: you insert the first blue tube into the black plastic base and then you simply keep inserting the next blue section into the one below it and keep traveling up until you reach the loop at the end. If I travel with this, it easily fits into my purse or my luggage. If I stay at a hotel with not much clearance between the bed and the nightstand, I can still insert the base under the mattress, insert the bottom-most blue tube into the base, and then build it up from there. This device is sleek sturdy and a delight to use. However the bedside table made by the same manufacturer has none of these attributes: The unpainted aluminum poles are very difficult to insert into each other I had to try several combinations before I could create the platform upon which my CPAP would sit. I am mechanically inclined and yet found it frustrating trying to get these tubes to fit into each other to create a platform upon which the CPAP would sit. Unlike the hose lift, this table has no elastic that keeps it easily assembled...also since there's nothing holding all these bits together I did have to corral the tubes between a couple of pillows because They wanted to roll off the bed? The edges of these unpainted rough sticky aluminum tubes were also rough to the touch -perhaps not quite rough enough that I would slice my finger on them, but they just didn't have the look or feel that I expected given I love the hose lift. Table sections that were just not coming together well, I would try a different tube that might fit better. If I were to keep this item, I would dread taking it on vacation with me because I would probably spent quite a few minutes taking each pole and trying to figure out where each end would best fit in the array very frustrating. Hi suppose I could take each section of this aluminum tubing and take a screwdriver and literally's core each and with a number that would have a matching number on another section but since I never had to do that with the lift it would be a real pain in the neck. These metal tubes were also quite sticky as if someone had torn off some very old tape from the tubes, yet had never cleared off the old gummy bits. The surface of each one of these tubes also is not slick and smooth as they are with the hose lift. I use the Fisher and Paykel Icon, and that device does fit on the sagging bit of plastic that is secured to the table's base via snaps. I dislike this plastic fabric being used in this matter because the device does get warm, and with it placed in this sling, it is less able to dissipate heat it creates especially when I am running the humidifier. It also feels less dirty to me so if I were to keep this device I would probably use some bungee cords to secure the machine to this table base so that it would not tip over or slide around. Finally, once I got the device assembled I realize that the bulk of the part that goes under your mattress for what appears to be a couple of feet is has corners and is thicker, so since I have a soft side waterbed, I quickly realized that there's no way for me to slide this under the mattress because it is so long and the end of it is so bulky plus the weight of the water in the mattress is such that I can't get it under the mattress unless I were to somehow get a couple of pry bars to lift up the section of the water mattress and thus create a 'hole' through which I could insert this long base. But then, how long will I go before that base interferes enough with my water mattress that it pokes a hole in it. It certainly is not convenient enough for me to set it up and then take it down to go travel and then put it back in again. It's a major endeavor to get this set up the soft-sided waterbed makes it impossible for me. Probably not bad if you have a very light mattress. DHM Notes: Hello, and thank you for writing such a thorough review! We're glad to hear that you're happy with the CPAP Hose Lift and we're sorry to hear that you weren't happy with your Bedside CPAP Table. I've asked one of our representatives to get in touch to see if we can send out a replacement unit because it sounds like the one you received does not live up to Arden's stringent manufacturing specifications. If there's anything else we can help with please let us know. Take care! I am very pleased with this table. It's sturdy and my cpap fits on it perfectly. It was easy to put together and will be great to travel with since it breaks down into a small, compact box. I was concerned about whether it would work for me because I have a sleep number bed which has an air matress but it works great with it. I am very happy with this product. I am very happy with the table. I gave the first one to My Mother and bought a new one for Me. I used mine down at her place and it work great. This table is exactly what I needed for a CPAP unit. The table is sturdy and stays in place. Just ok. Because it is made of a fabric material it doesn't provide adequate support for the CPAP machine. Causes it to sagg and as a result the water in the humidifier tank is not level. Also difficult to remove the tank while sitting on the table so it must be removed completely to add water. I put a piece of plywood on top to give it more support. Works very well. Has a long double bar that tucks well under the mattress so there is no risk of it slipping or falling. Easy to assemble and put in place. Keeps the CPAP machine off the bedside table. Very neat idea. Have always looked for something that wasn't as big as a table and this was perfect. Slides between the mattress and box Springs. PerfeCT! Will be perfect for traveling especially.